First things first, darlings! The winner of CC's Haute Halloween StockinGirl.com Giveaway is the lovely Stella ~ congrats! Pink living room pictured via elledecor.com. Vivienne Westwood Anglomania Fond draped crepe dress; this and next at net-a-porter.com. Alexander McQueen Skull woven leather box clutch. 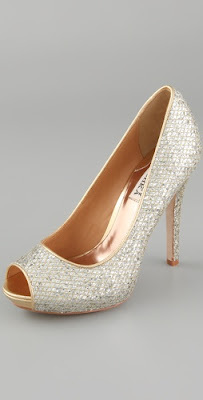 Badgley Mischka Humble glitter pumps; this and next at shopbop.com. Tory Burch classic mini bag. Darlings, what do you think of this pink space and the look it inspired? I would love for you to enter to win a beautiful necklace over at Lilac and Grey! My little sweet niece would lurrrve to live in that PINK-wow room! PINK PINK PINK.... for Breast Cancer Awareness! Me quedo con los complementos en color plata. Beautiful!love colour pink ,I love it,I love it! love that room, so stylish!! Loving the bag! Such a great element to add to a simple jeans and white shirt combo! You know how much I love this weekly post! That Westwood dress is to die for! I want it in my closet now! p.s. Thank you CC so much for your spray recommendation, I'm going to look for it asap! omg! this space, is my dream! xooo,darling! that is perfect. pink and silver. the crepe dress is the perfect shade of pink--i adore it. I love the clutch and that room is so sweet. I also enjoy these architectural posts! LOVE,,, WANT! I love pink and I love the room. I hope these pink winds up being very much in vogue because I would like to own clothing and lingerie in shades like that as well. How fitting "Pink" for October ! Luv it! love that pink dress! so pretty! hot pink! shi shi shi! Ah, this reminds me of my childhood bedroom growing up. I had the full on pink walls too. So girlie yet sophisticated. Love that dress and the shoes! Which girly girl here doesn't like pink fabulousity? :)) Great post!! The dress is simply amazing! Loooove McQueen bag too! I love pink. The clutch is fabulous. Wow that is such a pink room. Most of us like the colour pink, such a lovely bright, girly colour. 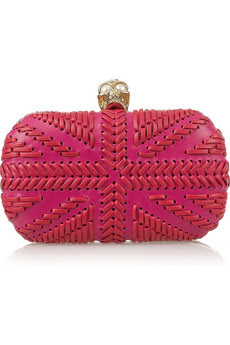 Gotta love the McQueen clutch! I would love a pink room like that! And the Tory bag is pretty fantastic. Love the dress and the clutch!!!! Loving all that pink Carrie! The classic mini bag is adorable!!! I love that pink clutch! i never seen a clucth like that! pretty in pink! I am just loving that pop of pink!. What a great store! I just discovered your gorgeous blog through one of my favourite blogs 'Gild & Grace'. I have just signed up as your latest follower! I look forward to popping by for some more inspiration! Chic Business Cards & UPrinting Giveaway! Gorgeous Jewelry & In Pink Giveaway! Haute Halloween & StockinGirl.com Giveaway!